CRIME, GUNS, AND VIDEOTAPE: Crimefile’s Exposé Of TSA Pilots Booby-trap Holster Finally Got Results! Crimefile’s Exposé Of TSA Pilots Booby-trap Holster Finally Got Results! Washington, DC—It has been nearly I year ago when I exposed some “classified’ information on the dangerous conditions the TSA created with a bizarre holster requirement. 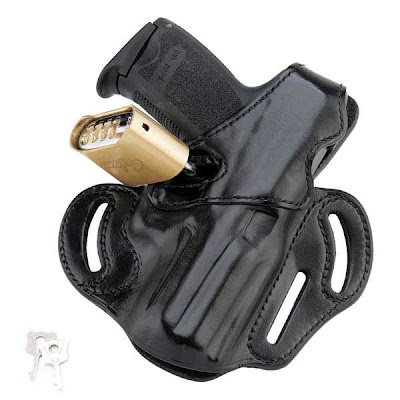 The TSA mandated that pilots participating in the Federal Flight Deck Officers carry their loaded service pistols in a holster with a padlock across the trigger. The holster violated both safety rules and common sense. The locking holster turned the weapon into a deadly booby-trap causing the gun to be unintentionally fired. It was less than four months later when US Airways Captain James Langenhahn’s pistol discharged while he was stowing it away as his flight ended. I put together a video to show precisely how the accident happened and placed it on YouTube and other video sharing sites. The videos received a half million hits. CNN and other news outlets covered the story using my demonstration of the involved equipment. Langenhahn was removed from the FFDO program and fired. I think it’s clear that the TSA created the dangerous conditions and Langenhahn should be cleared, reinstated and given back pay along with his legal fees. Now investigators from the Office of Inspector General has released their report to Congress recognizing the danger and recommended finding an alternative to the current method to insure safety. TSA is a joke.I see the scum they hire at Ohare/Midway. Pilots are sworn as Federal Law Enforcement Officers. They should strap the weapon/holster to their belt at the beginning of the day nad not touch it (unless needed) until they undress at the end of the day. Like any other LEO. If you are held responsible for a 50million dollar airplane and hundreds of passengers lives a day, you should be given the responsibility of wepon's retention.